"Military families left behind to fend for themselves become very independent over time, and often the soldier finds it difficult to fit in when he or she returns." - J. Douglas Bremner, MD. The Callaway Homecoming Initiative is designed to help members of the U.S. Military reconnect with their families and assimilate into a peacetime home environment upon return from combat deployment. Set on 13,000 acres in the foothills of the Appalachian Mountains in west-central Georgia, this program brings soldiers and families together – at no personal expense – in a spectacular and serene setting, far from the stress and anxiety of war. Re-entry into family life is sometimes challenging for both soldiers and family members, particularly after numerous deployments. 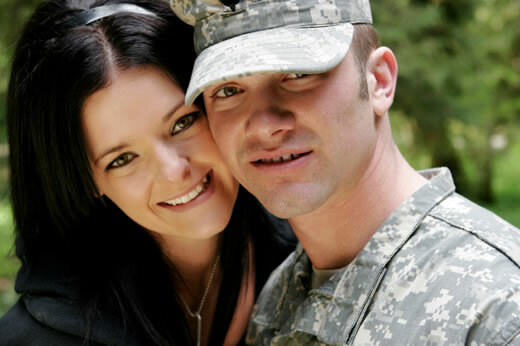 Department of Defense statistics say that the number of military divorces has been steadily rising from 2.6 percent in 2001, to 3.7 percent in 2011. The most recent civilian average, according to the Centers for Disease Control and Prevention, is 3.5 percent. In order to help families assimilate, Callaway Gardens, Fort Benning’s Maneuver Operations Center for Excellence and Emory University have been working together to create the Callaway Homecoming Initiative (CHI). "Military families left behind to fend for themselves become very independent over time, and often the soldier finds it difficult to fit in when he or she returns," says J. Douglas Bremner, MD, professor in the Department of Psychiatry and Behavioral Sciences and Director of Mental Health Research at the Atlanta Veterans Affairs Medical Center. "Decisions related to parenting, finances, and all the routine daily tasks have been the sole responsibility of the spouse, who suddenly is expected to give up control when the soldier returns. Additionally, the soldiers have missed seeing their children grow and mature, and being involved in their activities. They may feel like strangers in their own homes." CHI is a pilot program that is bringing service members and their families together to experience a ten-day retreat at Callaway Gardens April 26-May 6. While there, the families have an opportunity to spend time together in a serene setting, participate in a regimen of outdoor team challenges and enjoy recreational activities. Additionally, the families will be attending educational sessions that are intended to help the spouses, the soldiers and their children in dealing with the transition from deployment to family life. The sessions were developed by Emory’s Clinical Neuroscience Research Unit, which is headed by Bremner. Experts from around Georgia have volunteered their time to conduct the lectures. "With all expenses paid and a comprehensive program that addresses all aspects of the combat-to-peacetime transition, CHI is a win-win prospect for everyone – soldier, family and society at large," says Bremner. "Callaway Gardens was created to provide a place of nourishment for the soul, consolation for the heart, and inspiration for the mind," adds Edward Callaway, Callaway Gardens’ chairman of the board. "What better group of people to engage in this environment so that they can benefit from its beauty, at such an important and critical time in their lives, to reconnect with themselves, their families and their homeland after providing such an incredible service to our country." The families participating in the pilot were each chosen from a different brigade at Fort Benning. Bremner is applying for a grant to fund future retreats. Visit the CHI page on Facebook and follow the program on Twitter @CHI_Georgia for updates. For additional information, email info@callawaygardens.com.